It was a tough old Monday morning here at Go Stay Work Play Live HQ back on March 12th, which will not be news to those of you who follow my on-again, off-again Twitter feed. Yes, I had my driving test. No, I did not pass my driving test. A little background is probably required here. I have been driving in Canada since 1985, and I think it's fair to say that is a respectably long time. To give a bit of perspective, when I got my driver's licence Ronald Reagan was President of the United States, Live Aid was raising money for famine in Ethiopia, and "Back to the Future" (the first one) was a summer blockbuster. So I think we can agree that I am not new to the whole business of safely piloting an internal-combustion-engine-driven conveyance around the roads. I've never even had a bloody speeding ticket. And because of Canada's preferred status as a Commonwealth nation, I was allowed to exchange my Canadian driver's licence for a UK one in a straight swap. Handy. However - and this is the maddening, hair-pullingly frustrating thing about this whole business - UK licences are issued according to the type of vehicle in which you passed your test. If you drove an automatic transmission car in your test, you are restricted to driving automatic transmission vehicles only and there will be a little notation to that effect on your license. Want to drive a manual? Pass your test in a manual. When I tell people here that Canadian licenses don't differentiate and that the Canadian system assumes that if you don't know how to drive a manual transmission car you simply won't drive a manual transmission car their reactions range from mild incredulity to scandalised shock and disbelief. It's as if they envision an entire nation of drivers grinding their gears into fine iron filings and rolling backwards into other cars, cyclists, passing pedestrians and the occassional stray puppy. I promise, it's not like that. At first I thought there might be a way to get some kind of documentation from Canada that would prove I was not new to the clutch and the gear stick. Something, say, that showed I owned, registered and insured a series of manual transmission vehicles for more than 20 years in Canada, perhaps? I got in touch with the UK authority for this kind of thing, the DVLA (Driver and Vehicle Licensing Agency). After politely asking what sort of document might solve this thorny issue, I was told I'd need to provide proof of having passed my test in a manual in Canada. But wait, I said, no one records that kind of information in Canada because NO ONE CARES. Was there not something else I could send? Unfortunately because the Canadian Authorities do not record the type of transmission used in a test, when a driver exchanges a full Canadian licence, the British licence will be restricted to automatics unless the driver can provide confirmation from the relevant licensing authority that a manual test has been passed. Is it just me, or is this circular logic? Here's how I read this: "We know Canada doesn't keep track of this stuff. Nevertheless, you have to produce a document (which we know does not exist) to prove this thing that no one wrote down 25 years ago. Thanks for playing." Nonetheless that's how it is. If I want to be legally permitted to drive a manual transmission car - and almost all cars over here are manuals - then I have to pass a UK driving test in a manual transmission car. So I decided I'd just have to grit my teeth and take the test. However, I was not so arrogant as to think that, 25 years after I last took a driving test, and in a country where they drive on the wrong/other side of the road, that I'd be able to manage a pass without taking a few lessons. So that's what I've been doing for the last few months. I booked a test date - March 12th, 9:07 am, at the Hither Green Test Centre (which sounds like it should be a sylvan paradise and is in fact a faceless London suburb somewhere to the right of Peckham). Then I booked a package of 10 hours of lessons with Red Driving School. The practical test fee is £65. The lessons were £250. This is not a cheap business. It turned out that my instructor - Mohammed - was a lovely guy, and I got along with him really well. This is partly because he laughed at my jokes, and partly because he was pretty damned patient with me, and my sloppy haven't-had-to-pass-a-test-in-25-years driving habits, and my incredulousness about all kinds of quirks in the UK driving system. 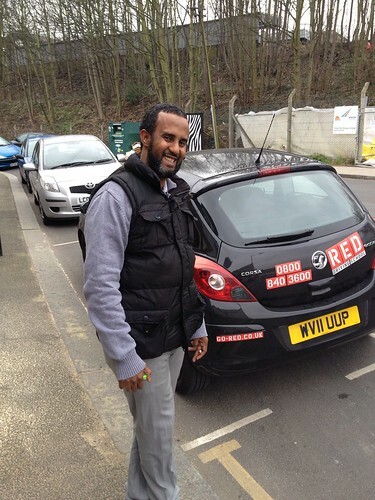 The lovely Mohammed, and the tiny black car. Mohammed quickly determined that he didn't need to teach me how to drive, he needed to teach me how to pass the test, which are two very different things. There are lots of things to trip up on. For instance in North America the habit is to signal first, then check mirrors and shoulder check, and then carry on. Here the mantra is "mirrors, signal, manoeuvre". It's iron-clad. Signal before you check and you'll be assessed a minor fault during the test. 15 minor faults and you fail. Four minors of the same type and you fail. And if you cause another driver to slow, swerve, stop or swear (the four Ss) that's a serious fault and you might as well pack up and head home. One serious fault and all is lost. Of course you've also got to demonstrate proficiency with a number of manoeuvres like the dreaded parallel park (here called reverse parking). There are five manoeuvres, one of which you'll be asked to perform during the test. They are: reverse parking (parallel parking), U turns, bay parking (backing into a parking spot), emergency stops, and the baffling Left Reverse Around a Corner. Yep. You have to prove you know how to BACK UP AROUND A CORNER, a move that would likely see you clapped irons if you tried it in any Canadian city. So Mohammed and I worked away on a series of Saturday afternoons. I drove and drove and drove, and he drilled me on the mirror-signal-manoeuvre business, and tried to get me to stop riding the clutch (a minor fault), and helped me get used to shifting with my left hand (weird! 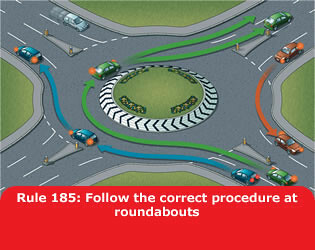 ), and quizzed me on theory questions, and guided me through countless roundabouts, which are a bit confusing. By the time we got to the last lesson on the Saturday before my test, I was feeling pretty confident. Mohammed and I parted ways and he promised to pick me up at 7am on Monday morning so that I could drive to the test centre and then have a solid hour of warm-up, practice my manoeuvres, and a zip through a few roundabouts before the test at 9am. All in hand. On the Sunday night before my test I was out at a lovely event with friends when I got a call from Mohammed who informed me that something had come up at the last minute and he would not be able to accompany me on my test the next morning. But I shouldn't worry because he'd arranged for another instructor from the same company to be there, in the exact same kind of tiny black car, at the same time, so it would all be fine. Suuuuuuure. I was nervous enough to begin with, and this did nothing to boost my confidence. The next morning Omar arrived as promised, and off we drove. We did not get far. As soon as I'd moved off (we don't call it "pulling out" over here) he told me to pull over. Omar: Did you notice that I'm not wearing my seatbelt? Me: Er... no, I did not. Omar: This is your responsibility as the driver. Me: No one has ever mentioned that before. Omar: But there is no one to see you indicate, so this is unnecessary. Me: I was taught to indicate when moving off. Omar: If you indicate when it is not necessary this can confuse other drivers. Me: That's not what I was taught. Omar: Do you always grip the gear stick this way? We call this "The Claw". Do you know the "Palm Method"? It is the preferred method. Me: (grinding teeth) I've been shifting this way for 25 years. Perhaps 45 minutes before my driving test is not the best time to try to change this. And don't even get me started on the "dry steering" and the reverse parking manoeuvre. So you can imagine that I was not filled with confidence going into my driving test after two hours behind the wheel with Omar. I'm not in any way implying that Omar was not a good, competent instructor. It's simply apparent that there are different schools of thought about some of this stuff, and Mohammed and Omar are in different schools. It's also apparent that the time to change schools is not on the morning of your driving test, because by the time we got back to the test centre after the warm up my confidence was lower than the parking garage under the ninth level of Hell. Given all that, I thought the test went fairly smoothly except for two things, which naturally were two things too many. I don't really want to get into exactly what happened, but let's say that in one case there was honking on the part of another driver, and though no one ended up in an ambulance, I suspect that at least two of the four Ss were involved (swerving and swearing, I think). It was not just a serious fault, but a dangerous fault. Game over. Of course the examiner was right to fail me on that, no doubt about it. But damn, I can't help but feel that I was not in the best head space for that test. It would have been stressful even with the lovely Mohammed in the car. After dealing with Omar and his Mmmms it was headache, dry mouth, about-to-burst-into-tears, off-the-charts stressful. I know I'm not even remotely objective about this, but it seems to me that the UK driving test is - and I think this is the technical term - bloody hard. 54% of all tests are failed, and only about 20% pass on their first attempt. People take an average of 44 hours of lessons before passing, though to be fair, most are new drivers who are figuring out everything for the first time. I've talked to people who had to retake the test SIX TIMES, and these are not mouth-breathing cretins, these are normal intelligent friends and colleagues of mine. (Incidentally, the record is 36 unsuccessful attempts at the practical test.) One friend failed the test for NOT driving in a bus lane when it was available to her. I'm telling you, they take no prisoners over at the DVLA. But here is the thing that makes me really crazy about this whole business. I HAVE A VALID UK DRIVING LICENCE. Her Majesty's government has deemed that I can be trusted on England's roads. In fact, before I traded my licence I could have driven any damned car I wanted, automatic or manual, on the strength of my Canadian licence. The minute I surrendered my Canadian licence for a UK automatic-only one I was suddenly no longer fit to drive a manual transmission car. Nothing changed about my skill level or experience, but now I'm a danger to myself and others if I get behind a gear shift. What the hell is that about? Ok, ok, ok, I just have to keep breathing calmly and get over this. I'm taking a bit of time to cool off about this, and then I'm going to phone those dragons at the DVLA and book another practical test. And then Mohammed and I will have another go at it. And if we're all lucky, I'll pass the next time and I'll be able to put this all behind me and you won't have to read another two thousand words of me ranting about the injustice of the whole stupid thing. Let's all just keep our fingers crossed. I was supposed to go on a bicycle tour of the City a week earlier than I did, though this was not because I was particularly burning with desire to do a Sunday morning cycling tour of the City of London. So as I was saying, I booked and paid for a cycling tour of the City not because I was particularly burning with desire to do a Sunday morning cycling tour of the City of London. I booked it because this particular tour is conducted on Brompton folding bicycles, and I am dead keen on Brompton bikes. I'm seriously thinking about getting one, but realised I'd never actually ridden one before and figured it might be a plan to do that before forking over the usurious sum of £800, which is the going rate for a basic Brompton. And then I discovered that there's an outfit here called Spoke 'n Motion that does cycling tours on Brompton bikes so I could try the bikes, get a tour, and maybe squeeze a blog out of the whole thing for a relatively measly £19. And when I discovered that the tour ended with a free pint in a nice pub... well you can imagine it didn't take me long to get out my wallet. So as I say, I was all set to go a week earlier, and even SET THE ALARM ON A SUNDAY MORNING to get there on time, but when I woke up and heard the rain and then checked the forecast for the rest of the day my heart sank a bit. Cold, rain, drizzle, mist, and then a bit of a downpour, just for variety. No matter, I steeled myself and decided to go anyways. London is the kind of place where you just have to accept that you're going to get wet some days. Then as I was eating breakfast my phone rang and it was the guy who owns the company calling to tell me that if I wanted to skip the tour and take a refund or a credit, then that was totally fine. How's that for customer service? I was happy for the reprieve that day and toddled off to the Science Museum for the afternoon, which I intended to blog about, but which honestly didn't really fire me up much. I told Ian (Mr. Spoke 'n Motion) that I'd take the credit and see him on the next sunny Sunday. So I set the alarm again the next week, which promised to be a much finer day, and rode my normal, boring full-sized bike out to Bermondsey, where the tour started. Ian was there, as promised, along with the only other participant in the day's tour, a pleasant but quiet guy from Singapore whose name I don't remember or wasn't told, so he shall henceforth be known as Singapore Guy. First, Ian introduced us to the bikes, which were my main reason for being there. 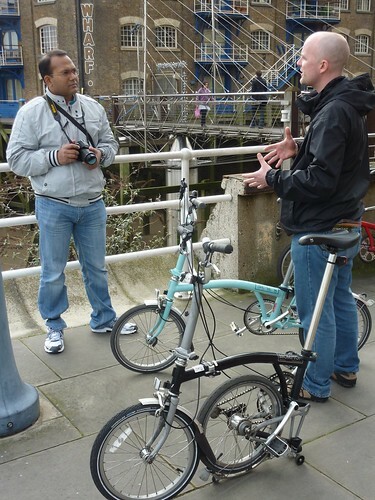 Bromptons are exceedingly clever, and Ian demonstrated the famous folding system. Singapore Guy and Ian, with my partially folded loaner Brompton, named Helga, in the foreground. Ian's unfolded light blue bike is in the background. When practised a bit the whole folding action takes about 20 seconds to go from functional bike to suitcase sized package. Watch the video on the website! We walked over to where the bikes were stored, and I got to have a go at the fold, and take a short spin to get used to the riding characteristics of the bike. Since the wheels are so tiny (just 16"! Cute!) a Brompton handles a bit differently than a bike with full-sized wheels. They're not as stable, but are definitely what most people describe as "responsive" and "zippy". It took a little getting used to, but soon I was totally comfortable. Other interesting features are the fact that, because the main framing bar is so low, it's really easy to get on and off the bike, and they don't need a kickstand because that half-folded state pictured above - which takes as long to achieve as it takes to deploy a kickstand - will stay upright on its own. So, in a word, the bikes are: cool. But what about the tour? Also, in a word: cool. 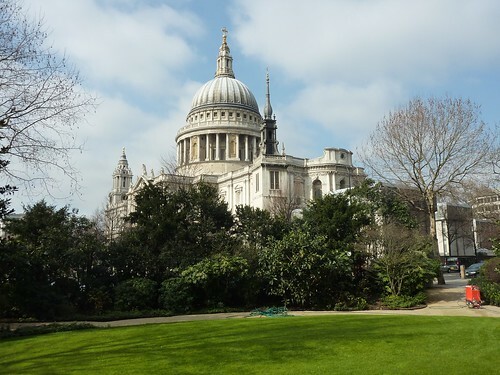 Though it was billed as a tour of the deserted City, we started on the south bank of the Thames and wended through a few interesting spots there before crossing into the City on Southwark Bridge. We learned that Patrick Stewart (yes, THAT Patrick Stewart) was a nearby resident and part of the fight to prevent a giant new sewer outfall from besmirching the riverbank in the neighbourhood. And we stopped at St. Saviour's Dock, where the subterranean river Neckinger meets the Thames. It's also the site of the infamous Jacob's Island, a notorious Dickensian slum made even more infamous as the site of the fictional death of Bill Sykes, the villain in "Oliver Twist". 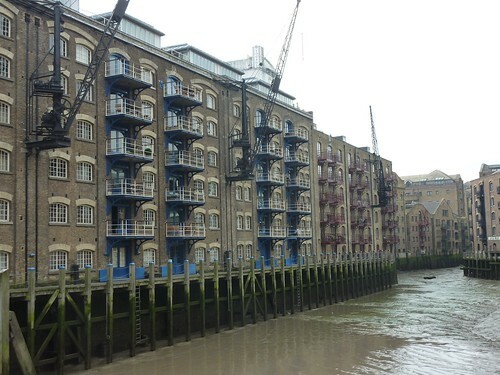 The Neckinger at low tide, and the buildings of modern-day St. Saviour's Dock. Now it's super-expensive real estate. Just to the left in this photo is apparently where a famous scene in "A Fish Called Wanda" was filmed. It's the one where Kevin Kline dangles John Cleese out the window. Ian even pointed out the exact window in question. We also stopped at another interesting site on the South Bank, near Tower Bridge. However, it was so excellent and quirky that I think it deserves a blog all its own, so you get nothing more here beyond that tantalising snippet. I will tell you that we also saw the only bar in London that does not require a liquor license. Known as a "free vintner" the Boot and Flogger is allowed to sell wine (but not beer or spirits) inside the City and three miles beyond, and claim to have been granted that privilege in 1567 by the first Queen Elizabeth. I know I say it over and over again, but these are the fun, interesting, offbeat things that crop up all the time in London. Looking particularly fetching on a sunny afternoon, I must say. We also pedalled over to the Smithfield Market area, near St. Bartholomew's Hospital. Barts, as the cool kids call it, is the oldest hospital in London, having been founded in 1123. Famously, it is the site of the first meeting of Sherlock Holmes and Dr Watson (in "A Study in Scarlet"). More recently, it was the scene of the (apparent) suicide of a modern-day Holmes in the oh-my-God-sooooooo-good-you-must-watch-them-all-NOW BBC series "Sherlock". The Barts/Smithfield areas is also the place of the martyrdom of the famous Scot William Wallace, who was hung, drawn and quartered in 1305. 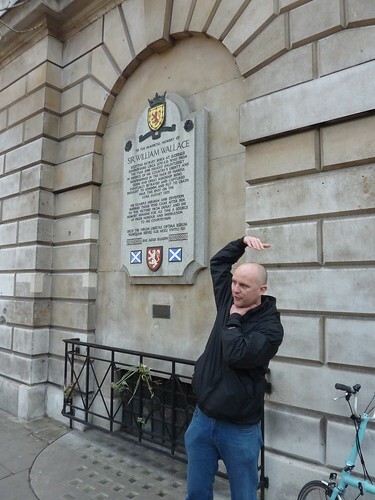 Ian, ably demonstrating the "hung"part of hung, drawn and quartered, next to the plaque commemorating Wallace's execution outside Barts. I haven't mentioned Smithfield Market before here - it's the city's main meat market, and has been so for, oh, 800 years. Many shops and restaurants in London get their meat at Smithfield's, which is the only "grand" market left in central London (Covent Garden flower and produce market and Billingsgate fish market moved out to larger digs ages ago). It operates from 4am to noon every day and nearby are the only pubs in London that are allowed to sell alcohol in the morning - for workers coming off the night shift. There's also a pub called the Fox and Anchor which serves a breakfast so popular that you need to make reservations to secure a table. Along with the usual full English breakfast offerings, it adds things like lamb's kidney's, calf's liver, kippers, and other Smithfieldian treats for a eye-watering £16.95. Vegetarians beware. After wending past a few more familiar spots like Guildhall and the Gherkin, it was finally time to turn our snazzy little bicycles southwards across Tower Bridge. The whole tour took a little more than three hours, and though I'd visited many of the spots before, Ian had a lot of new stories and facts that I'd never heard. And though the morning started out a bit grey and chilly it ended up being a glorious sunny day. So when we got back to Bermondsey and Ian stowed the bikes away for storage and asked if we'd like to go down the road for a pint, which was included in the cost of the tour... well I think you can guess what the response was. From left to right: the Thames, my beer, Ian's beer, Singapore Guy, Ian, and in the background, the Angel pub, Bermondsey. I haven't made any decision yet about whether I'll be buying a Brompton bike. But the Spoke 'n Motion tour definitely whet my appetite for them, so I think I'll plan to rent one for a week so I can see how those tiny wheels fare on my eight and a half mile commute and what it's like dragging the folded bike onto the train when I simply can't face the ride. And the fact that I got to try one out, and have a very well curated tour of the City and a credible pint of real ale in the bargain means that I can heartily recommend a Spoke 'n Motion tour the next time you're in London and looking for something a bit more interesting than the same old hop-on hop-off double decker bus tour.